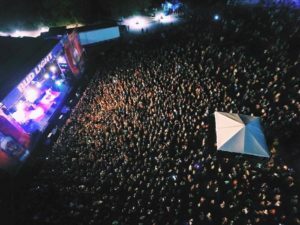 Turning into a major concert destination, Riverfront Park has hosted Rebelution, Sam Hunt, The Roots, Passion Pit, O.A.R., Umphrey’s McGee, Lee Greenwood, and many, many others. Stay tuned for upcoming show announcements. Riverfront Park is also home to the Greater Charleston Naval Base Memorial, erected in honor of the countless military personnel and civilians that served the United States and the Greater Charleston region while the Charleston Navy Base was operational. The Memorial is the only location in the United States that displays both the Lone Sailor and the Homecoming statues. Riverfront Park is also the location of North Charleston’s Annual National Outdoor Sculpture Competition and Exhibition. A component of the North Charleston Arts Festival, the Competition and Exhibition features large-scale contemporary sculptures on display throughout the year.